Throttlestop help - undervolt not applying? Discussion in 'Hardware Components and Aftermarket Upgrades' started by w.kni, Jun 20, 2018. The VID is slightly lower without the undervolt, which to me was a little surprising (I would have expected to see the VID for the undervolt setting sit at around ~0.42). I have tried checking to make sure SVID was enabled but am unsure how to do that on a laptop running Windows 10 (I've checked the BIOS but couldn't find it). Please help me understand what I am doing wrong or what I misunderstand! I am totally new to this kind of tweaking and am eager to learn. 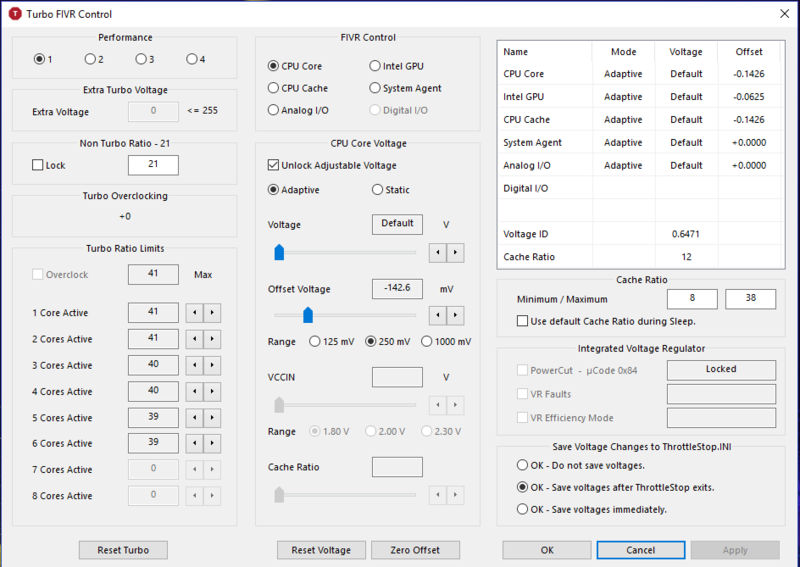 I've attached screenshots of both the benchmark settings I used and the undervolt settings I used. If I could provide any additional information that would help, please let me know. In both screenshots, the exact same under volt is being applied to your CPU. Look at the table in the top right corner of the FIVR window. That is live data. It shows the exact same voltage offset of -0.1426V for Core and Cache in both pictures. When Unlock Adjustable Voltage is not checked, ThrottleStop will not adjust your voltage. It will leave the CPU at whatever offset voltage it was previously at. To reset the voltage to a zero offset you have to check the Unlock box and specifically tell ThrottleStop to use a zero offset. In the monitoring table it will immediately show an offset of 0.000V for Core and Cache if you have done this correctly. As for your iGPU under volt, I think for this to work correctly, the System Agent offset has to be set to the same offset voltage as the iGPU. 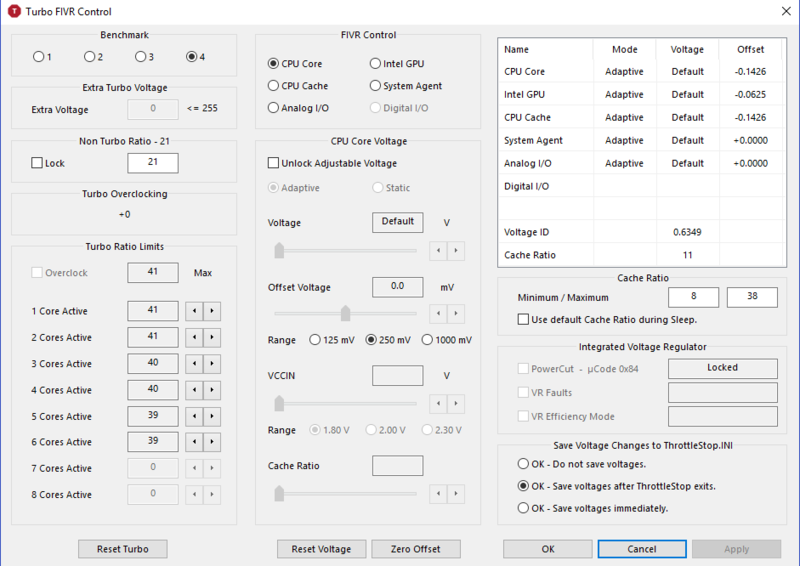 If you have an Nvidia GPU then I would not worry about fine tuning the iGPU voltage until you get everything else sorted out first. For maximum performance, I would enable Speed Shift and I would use an EPP value of 0. This is useful when plugged in. For a lower CPU speed when idle, switch the EPP value to somewhere between 80 and 128. Also get rid of the Clamp option in the Package Power Limits section. For anyone wondering, I am still alive. Just on a holiday from ThrottleStop. But I did get some work done on TS lately. 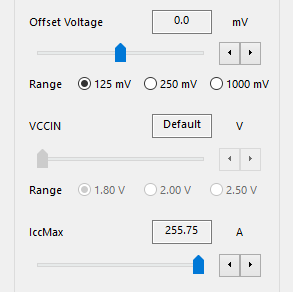 I have finished adding IccMax adjustment and that is working great. Looking to add AVX Offset adjustment too. TS is always a work in progress. intruder16, Papusan, 0lok and 2 others like this. Thanks a ton! 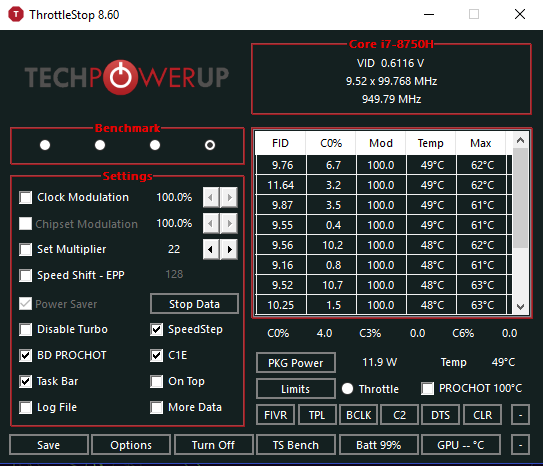 Just checking that box and correctly setting up the Benchmarking profile dropped my temperatures by about 3 degrees on the undervolt profile. I'm not sure why that would happen, perhaps it wasn't correctly applying before. I'll have to run a few tests and see what kind of heat I get under high CPU/GPU usage (I've been averaging around 80 degrees with frequent spikes to 100 degrees, I was hoping to avoid temperatures like that by undervolting). When is the version with IccMax be available? You can use XTU to increase IccMax. I have not yet heard from anyone that really needs this feature. I have seen EDP light up red in ThrottleStop - Limit Reasons but this is usually combined with PL2 or PL1 throttling. Increasing IccMax might not solve this type of throttling problem. Head over to the main ThrottleStop thread in my sig if you have some info or throttling problems that need to be talked about. Send me a message if you are interested in doing some testing. I might have something you can test available in the next few days or next week. Papusan and hmscott like this. I'm trying to play games on my Macbook Pro runninng bootcamp. The issue I ran into is that my CPU overheats (summer) and then it starts throttling. So, I'm trying to undervolt my CPU/GPU to see if I can get my temperature down and avoid throttling. Problem is that it seems my offsets voltages are not getting applied from what I read above. Not sure why. I had Intel extreme tuning installed, but didn't change a thing there and also uninstalled before using TS as I read that it could prevent TS from working properly. I also have MSI Afterburner installed. So not sure if that is the culprit. I'm also attaching a screenshot showing two instances (marked with vertical bars) where my CPU reached 95+ degrees so throtlling started immediately after on both GPU and CPU limiting my FPSs. Please let me know if you have more recommendations on how to limit somehow my CPU/GPU to improve my gaming performance. From what I tested, it seems that throttling is the main culprit on why I get sudden FPS drops and whatnot. EDIT: actually, I think Apple just locks voltage editing altogether. Hum, that's bad. Anything I can do about it? Any other sugggestions to try to prevent throttling? davaid, Apr 22, 2019 at 12:06 PM, in forum: What Notebook Should I Buy?